Help Princess save her beloved husband in this free game! If you like this free game, try Dragon Keeper. The evil witch is back and causing trouble in this exciting Time Management game! The Prince has been turned into a goldfish by the evil witch and the Princess has to save her beloved husband. Enlist help from the magical dragons to break the spell on the Prince. Breed dragons, hire a variety of magical creatures and learn how to cast dragon spells in Dragon Keeper 2! 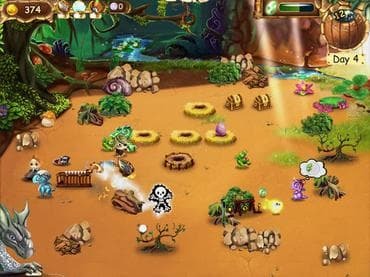 Download free full version game and help young Princess now! Free Game features: - Unique blend of match-3, hidden object and sim; - Fully interactive and customizable environment; - Bonus Hidden Object levels; - Tons of accessories and styles to choose from; - Vivid and charismatic characters; - Witty dialogues and immersive story line. If you have questions about Dragon Keeper 2 game, please contact us using this form.